Now I'm trying to stay away from cake baking, I've been bitten by the bread baking bug again. So this is my second bread post in two days. 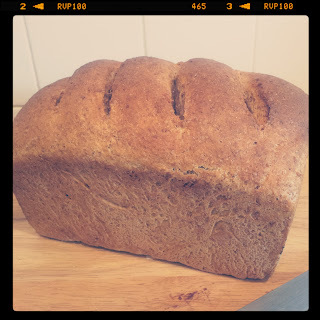 Pretty much all of the bread I've made during the writing of this blog (until yesterday) has been based on white wheat flour and so I thought it was time I gave wholemeal bread a whirl again. My copy of Short and Sweet is still in the boot of the car where it's been since I gave my presentation entitled "Lil Ms Squirrel's School of Economics" on Wednesday so I thought I'd do some research on the web for a good, basic recipe. After discounting Delia Smith's 100% wholewheat bread, I happened across an article by Felicity Cloake on the Guardian Website. On a regular basis, she'll test the wise words of many famous cookery writers with the goal of finding the best method for making a dish, thereby writing her own recipe. Back in the early days of writing this blog, I thought I might do similar. In some ways, I've done that with naan breads and meatballs, but not really with anything else yet. On this particular occasion though, she ends up in conceding that Dan Lepard truly is the master of bread making and literally using his recipe to make her own bread at the end of the article. The only difference is she claims to use more salt and water in the ingredients list. Although if you actually read it, she says to start by adding the same 300ml that Lepard recommends and then adding in some of the remaining 100ml but only if you need it. I found that 300ml worked perfectly well for me. Lepard advocates the use of vitamin C to help keep the crumb soft. I seem to remember this advice for making brown bread from back in my childhood - probably a tip picked up from my mother when she first tried to convert my family to eat homemade wholemeal rather than Mother's Pride sliced white. She never quite got there as my Grandad is an ardent anti-Lentil-muncher and still insists on white bread to this day. Anyhoo, I made my wholemeal loaf slightly differently as I'm still using up my thrifty tub of Active Yeast. That cost me 89p for enough to probably make around 15 loaves whereas if you buy the sachet stuff it's £1.09 for six loaves. This meant that I did slightly change the recipe, reactivating 2tsp of the yeast in the water (two parts chilled to one part boiled) with a teaspoon of sugar. I also didn't use vitamin C as I had none to hand. I wasn't too sure what would happen if I stuck a Berrocca tablet in with the yeast. That's an interesting experiment for another day. I followed the rest of the recipe, with the 10 second every 10 minutes kneading and then baking at 220c for 20 minutes before finishing off at 200c. And I got a pretty good looking loaf. Due to a change in plans, we've not road-tested it at the time of writing. I have a brief respite from parenting so wanted to get the blog mostly blogged now so that I can have a quiet evening. We had lunch out (hence why the loaf didn't get eaten) and that means I won't have to cook dinner tonight. Instead, the loaf will probably be used for sausage sandwiches later on. If it is, mine will be laced with Chilli Jam. Yummy! I'll update the blog with the verdict later and will definitely try the Vitamin C thing another day if this loaf isn't up to scratch. And the Berrocca method - purely for the entertainment value. You can find the article by Felicity Cloake here. It also contains a link to Dan Lepard's recipe for a simple wholemeal loaf. Thomasina Miers "The Original Caesar Salad"